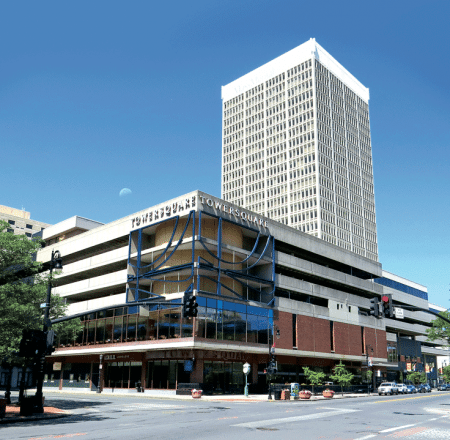 Since it opened nearly a half-century ago, Tower Square has been both a prominent part of the Springfield skyline and a barometer of sorts for the health and vitality of the city and its downtown. And this explains why there is so much anticipation and speculation accompanying the announcement that the property is being put on the market by owner MassMutual. Experts agree that this will be more than a real-estate transaction — it will likely also be a referendum on Springfield and its apparent resurgence. 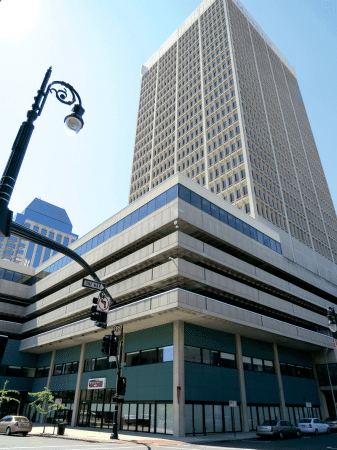 Ever since the news broke that Tower Square, the downtown Springfield office tower, hotel, and retail complex, would be put on the market by owner MassMutual, there has been seemingly no end to the speculation about this local landmark. And it has come in many forms, from questions about why the property is on the block — and why now — to conjecture about who might acquire it and at what price, what the new owner might attempt to do with it, and what role the complex might play in a changing City of Homes. It was that last question that Bob Greeley found the most vexing. 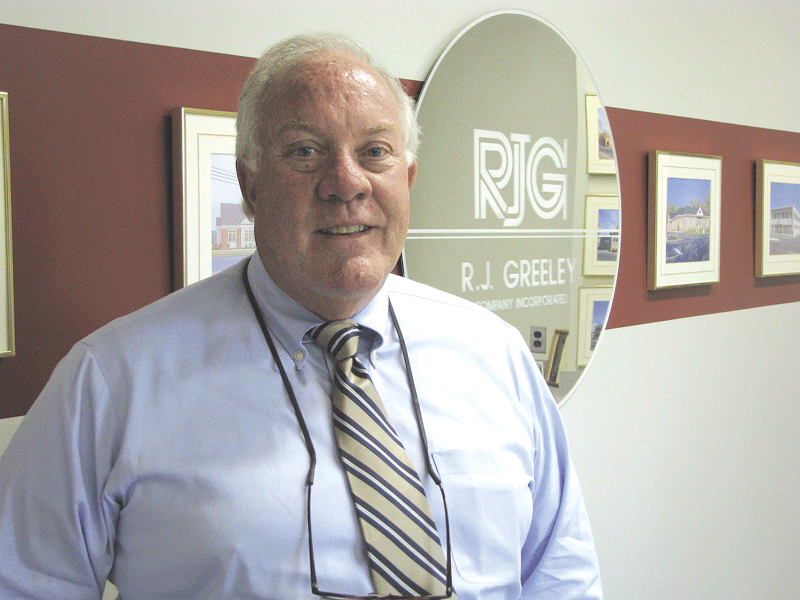 “What will downtown Springfield look like in 10 or 15 years … I couldn’t answer that one, and I don’t think anyone can — the city can go in one of many directions,” said Greeley, president of RJ Greeley Co. in Springfield and a player in the local commercial real-estate market for four decades. Most of those other questions were a bit easier to handle, for Greeley and others they were put to. Indeed, there seemed to be general consensus that there will be a healthy market for the property — and for a number of reasons, including its location (much more on that later), Springfield’s ongoing resurgence, the opening of MGM Springfield in 15 months or so, and the solid, consistent performance of the complex’s office tower over the past several decades. There also seemed to be general sentiment that there would be strong diversity among potential buyers, with interested local parties as well as national and international bidders. As for the role Tower Square will play in the future and the shape that property will take … here there was far less certainty in the experts’ voices and only conjecture — except when the subject of conversation was the approximately 180,000 square feet of retail space in the complex. Moving forward, and even now, for that matter, said Greeley, the term ‘retail space’ should probably be replaced by the phrase ‘commercial space,’ because retail, at least in the traditional sense of the word, almost certainly won’t be a big part of Tower Square’s future. Indeed, urban retail centers, or malls, if you will, which is what Tower Square was 40 years ago, are fast becoming a thing of the past, and, in most ways, they conflict strongly with most cities’ strategies for revitalizing their downtown centers, said Evan Plotkin, president of Springfield-based NAI Plotkin, who has spent considerable time and energy studying that subject. 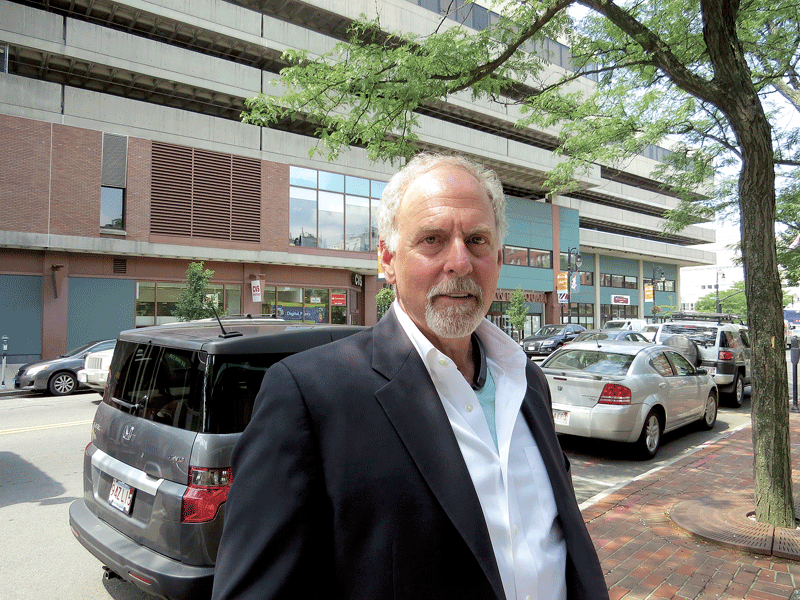 Bob Greeley is among those who believe the sale of Tower Square should be an effective barometer for Springfield’s resurgence and its prospects for the future. So what can and should happen at Tower Square in the years to come? Plotkin envisions a future with more of what is there now — meaning educational institutions such as UMass Amherst, which has a considerable presence in the complex with its UMass Center at Springfield, and Cambridge College. If nothing else, the sale of Tower Square should serve as a fairly intriguing barometer regarding the relative health of the city, its worthiness in the eyes of the development community, and its prospects for the future. For this issue, BusinessWest presents a snapshot, or summation, of the conjecture surrounding Tower Square, which will be the biggest commercial real-estate deal (outside of the casino, of course) in nearly a quarter-century, but also much more than that. In many ways, as Kennedy noted, it could be a referendum on Springfield — both its present and future. Plotkin often talks about his grandfather, Samuel D. Plotkin, whose full name was over the company’s door for decades, and the real-estate maps he created for not only Springfield, but a host of other cities as well. The maps were essentially grids that assigned scores, or values, to blocks and individual properties based on location and other factors. In Springfield, the block of Main Street between what is now Boland Way (years ago, it was Vernon Street) and Bridge Street, has always been what Samuel Plotkin called a ‘100% property,’ said his grandson. Area brokers say Springfield’s resurgence, the arrival of MGM in 2018, and the office tower’s historically strong performance should create a solid market for Tower Square. So historically — and into the future, by most all accounts — Tower Square has that first axiom of commercial real estate — ‘location, location, location’ — well-covered. But that’s only one of the factors that go into the sentiments of general optimism with regard to the sale of the property, the interest it will generate, the price it will command, and the speculation (there’s that word again) that this will be anything but the fire sale that was the acquisition of Monarch Place by Peter Picknelly in 1994 for $25 million, roughly a quarter of what that complex was built for less than a decade earlier. Others include the generally high-performing, 370,000-square-foot office tower, said Greeley, adding that location certainly plays a role in that success. And while there is some debate about just how much office space will be needed in the future and where it will be needed, the consensus is that 1500 Main St. will long be a business address in considerable demand. Meanwhile, the city’s resurgence and the opening of MGM in the fall of 2018 are forces that are projected to make the Tower Square property — and others, for that matter — more valuable and saleable. But the question of what the eventual buyer will do with the balance of the property outside the office tower — meaning the Marriott hotel and the 180,000 square feet of retail space — remains the biggest unknown and a question without an easy answer. Indeed, while several new tenants, including UMass, Cambridge College, Hot Table, and Valley Venture Mentors (soon to vacate its space and relocate to the Innovation Center) have moved in over the past decade, the vacancy rate in the retail component of the building remains high, so much so that it might become a drag on the property during the sale process, said Plotkin. Elaborating, Plotkin and others said the retail scene has changed dramatically over the past several years, with Internet sales taking a huge toll on national chains ranging from Sears to Staples, and also on shopping facilities, including urban and suburban malls. This brings Greeley back to his comment earlier about how the retail space in Tower Square should probably be classified as ‘commercial’ moving forward, a term that has a much broader meaning and one that hints at the wide range of possibilities for that space. Elaborating, Greeley said that eventual uses for those spaces will still have to be synergistic with the office tower and the hundreds of people working there, a consideration that will in some ways limit what can be done. “You’re not going to put a Chuck E. Cheese in there,” he said with a laugh, adding that many other forms of entertainment and hospitality, especially those focused on children and families, which are now populating suburban malls, may be similarly inappropriate. Plotkin said some urban malls and properties resembling Tower Square in some ways (it is fairly unique in its overall composition) have been repurposed for housing and other uses, such as higher education, but overall, such assignments require imagination and capital — and in large amounts. He suggests that more of the “college campus” components, as he called them, might be appropriate and, more importantly, viable. “Education is one of the directions I would be looking at when it comes to redeveloping the property,” he explained. “It could be a law school, it could be a research facility — there are a number of possibilities. “We should have something happening there that is going to draw young people to the facility,” he went on, adding that educational facilities could in many ways feed off, and contribute to, the growing entrepreneurial ecosystem in downtown Springfield. Evan Plotkin says the retail component in Tower Square remains a challenge, and that more education-related facilities may be the most viable option for that space. Elaborating, he said the Marriott hotel and its 260 rooms could possibly be retrofitted into a dormitory, bringing a residential campus into the realm of possibility and also the prospect of several hundred young people living in the downtown area, which could fuel further growth of hospitality and service-related businesses. And with the office tower and its broad mix of tenants in sectors ranging from law and marketing to accounting and financial services, there would be ample opportunities for internships and other learning experiences. And from a big-picture perspective, Tower Square will be just one piece of the puzzle, he went on. 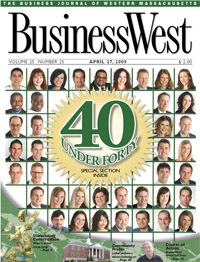 Overall, Kennedy said Springfield’s resurgence and a host of additions to the business and cultural landscape — from MGM to CRRC; from a renovated Union Station to the Innovation Center taking shape on Bridge Street — are creating more interest in the City of Homes, and Tower Square could play a role in bringing more businesses here, either through the office tower or its other available spaces. That last bit of commentary was offered in reference to the city as a whole, but also to the pending sale of Tower Square. This will be a real-estate transaction, but also much more than that. As Kennedy and others noted, it will be a referendum or bellwether of sorts on Springfield’s ongoing resurgence and prospects for the future. And it may also be one of the larger determining factors when it comes to what that future might be — for the downtown and the city as a whole. That’s why all that speculation is going on, and also why this will be a very closely watched real-estate transaction.